"After I graduate, I want to be involved in evangelism and go somewhere that has little access to the Gospel. God will show me where that is." 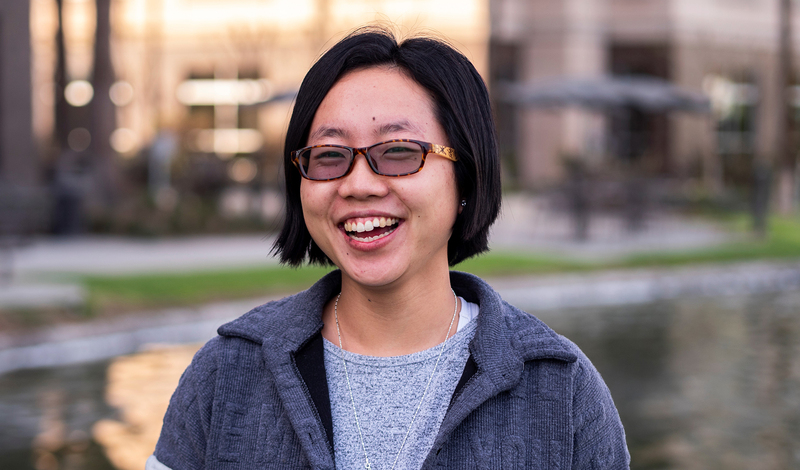 Erin Li grew up in rural China, the daughter of farmers. From an early age, she knew something was missing from her life. She felt that life was too self-centered, to focused on money. and too superficial. In college, she met an American student who shared Jesus with her and invited her to join a circle of Christian friends. "I found answers to the questions I had my whole life. I became a Christian, and I became grounded in Christ and began growing." Erin had a desire to go to America where she hoped to know what real Christian fellowship was like in a country grounded in faith. She applied for admission to a college in California, which led to an interest in further Bible study. "I graduated from the university in December and enrolled in the Master of Divinity program at Gateway in January 2018. After I graduate, I want to be involved in evangelism and go somewhere that has little access to the Gospel. God will show me where that is." Throughout Erin's life, God worked through Christians to light her path. Now she wants to do the same for someone else. The cost of preparing Erin to go wherever God calls her far exceeds the tuition she pays. As you plan your end-of-year giving, I hope you will prayerfully consider a gift to help prepare students like Erin to go and proclaim the Gospel to every corner of the Earth. You can give by the form to establish a Monthly Gift or by contributing a One-Time Gift. Thank you for your faithfulness in shaping leaders who advance God's kingdom around the world.